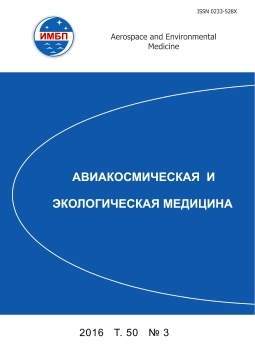 The peer-reviewed scientific and applied journal Aviakosmicheskaya i Ekologicheskaya Meditsina accepts experimental and theoretical papers from the national and international authors on topical issues of aviation, space, marine, diving, sport and ecological physiology and medicine. The main journal headings are Reviews, Experimental and theoretical research, Clinical investigations, Methods, Short communications, Discussion, Letter to the editor, Commentary, History of space biology and aerospace medicine, News and announcements. The publication does not charge fee from the authors. 1967 – 1974 was named "Space Biology and Medicine"
1974 – 1991 – "Space Biology and Aerospace Medicine"
1991 – "Aerospace and Environmental Medicine"